Secondhand Souls By Christopher Moore. 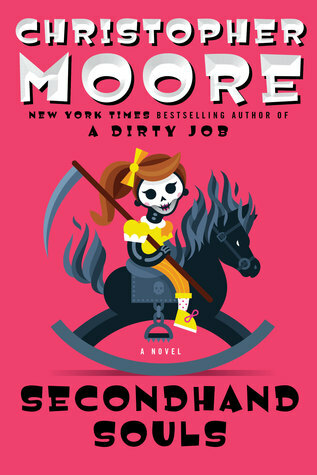 In Secondhand Souls, the sequel to New York Times bestselling author Christopher Moore’s A Dirty Job, the souls of the dead are mysteriously disappearing in San Francisco. People are dying without their souls being collected. No one knows who is stealing them and why and most importantly where the souls are going. Death Merchant Charlie Asher, trapped in the body of a fourteen-inch-tall “meet” waits while his Buddhist nun girlfriend Ashley [“She was a Buddhist nun who had been given the lost scrolls of the Tibetan Book of the Dead and she could do things that no one else on earth could do, but she couldn’t do what Charlie wanted her to.”] finds him a new body to serve as host. A diverse crew bands together to solve the mystery of the missing souls: the seven-foot-tall death merchant Minty Fresh; retired policeman turned bookseller Alphonse Rivera [“He’d peacefully taken an early retirement from the force, opened the bookstore, and set about reading books, drinking coffee, and watching the Giants on the little television in the shop. Nothing had happened at all.”]; the Emperor of San Francisco and his dogs, Bummer and Lazarus; and Lily, the former Goth girl [“She sighed, a tragic sigh that she didn’t get to use much anymore since she’d been forced by a brutal society to behave like a grown-up, and since she’d lost weight, most of her mopey Goth clothes didn’t fit, so she was almost never dressed for tragic sighing.”]. It’s zany and sharp with outrageous characters and a clever storyline and dark humor. I didn’t read A Dirty Job and perhaps I should’ve done. I’ll absolutely read another Christopher Moore. I’ve heard great things about Sacre Bleu. Recently Christopher Moore took the time to answer some questions. Amy Steele: Why did you want to write a sequel to A Dirty Job? Christopher Moore: My readers kept requesting it and I was at a place in my schedule where I wanted to write another book set in San Francisco, since I live there and wouldn’t have to travel for research. Christopher Moore: I don’t mind writing them, but in a way they feel more difficult than writing a solo book because I’m so conscious of not wanting to write the same book twice. Amy Steele: What’s the most challenging aspect of writing a sequel? Christopher Moore: To have new things happen to the characters, give them new problems to solve and not just replicate those I created in the previous book. Amy Steele: How did you come up with this idea about death and soul collection? Christopher Moore: I had been caring for my dying mother, then a couple of years later, helped with the care of my wife’s mother, and I thought I had something to say about death and dying. The transfer of souls was just something I thought was goofy, although it’s based a bit in Buddhist theology. Amy Steele: Who is your favorite character in Secondhand Souls and why? Christopher Moore: The Yellow Fellow, a mysterious and magical gentleman who is all dressed in yellow and drives a ’49 Buick. Amy Steele: Where did the idea come for the Squirrel People? Christopher Moore: From the work of an artist named Monique Motil. She actually creates sculptures like the squirrel people, making them out of real animal parts and making elaborate costumes for them. I saw her creatures in a gallery when I was researching A Dirty Job and I asked her if she’d be okay with me putting them in a book, giving them personalities. She loved the idea, so I created them. Amy Steele: How did you get into writing? Christopher Moore: I read a lot as a kid and was pretty good at writing stories for school from the age of 12 or so, so I just pursued it, on and off, until I started making a living at it. Amy Steele: What do you like best about being a novelist? Christopher Moore: Being able to pick a subject or a place I’m interested in and make that my job for a couple of years. I’ve been able to do some terrific things because I chose to write books about a given place or subject. Amy Steele: San Francisco is very much a character in your novel. How do you incorporate the city in such a seamless, intriguing manner? Christopher Moore: It’s not hard. San Francisco, like most of the great cities of the world, has a real personality, with all the different facets of a human personality, so I just treat the city that way. I also have great affection for the city, so it’s easy to write about it. Amy Steele: Do you come up with characters or plot first? Christopher Moore: Sort of at the same time. A Dirty Job started with this line in a notebook about fifteen years ago. “A guy who’s a hypochondriac gets the job of being Death.” So you sort of have plot and character in that one line, or at least the start of it. Most of the books start with a similar notion. The minor characters are created because I need someone to do something or say something to make the story work. Amy Steele: Do you write from an outline or free form it and allow characters and story development to be organic? Christopher Moore: It depends on the story. Some of my books are based in history, and real historic events, so I have a timeline I have to work within. Sacré Bleu, my book about the French Impressionists, was that way. I had to figure where everyone was at any given time and thread the story through history, so those are pretty tightly outlined. Other books, like A Dirty Job, are way, more organic, and I’ll just have bits and pieces that will fit in somewhere. The structure will suggest itself as I go along, so I will end up with an outline for at least the last third. I don’t rewrite a lot, so I can’t afford to go down the wrong road for very long, so some planning has to be done as I work. Amy Steele: An Instagram friend wants to know what Shakespearean play you will turn into a book next and will you write any more stories from the Bible? Christopher Moore: I don’t know about doing anymore Bible stories, but I wanted to do a new book with Pocket. I can’t say the play, but it’s one of the comedies this time. Amy Steele: Another friend Ashley asks if you prefer to write historically-based/literary characters or developing your own? I want to know about the challenges in writing both. Christopher Moore: I like putting my own characters among historical characters or characters drawn from the Bible or Shakespeare. Although writing dialogue for Toulouse-Lautrec was great fun in Sacre Bleu. Amy Steele: What’s on your nightstand to read now? Christopher Moore: Savages by Don Winslow, World War Moo by Michael Logan, and If He Hollars, by Chester Himes. 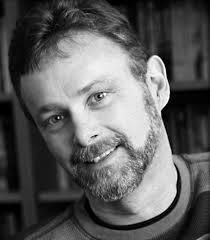 Christopher Moore will be reading for Brookline Booksmith at the Coolidge Corner Theatre at 6pm on September 2. This entry was posted on August 25, 2015, 00:29 and is filed under Books, Interview. You can follow any responses to this entry through RSS 2.0. Both comments and pings are currently closed.